Today we are super excited to announce our collaboration with ZEIT ONLINE. Working with Germany’s most prestigious media brand we created ZEITmagazin ONLINE which will serve as a home for yet unseen daily magazine journalism. For the first time, their content offering is served fully responsively, fitting nicely into every reader’s device – as is their advertising accordingly. The site was built from scratch with the focus on creating rich story formats. 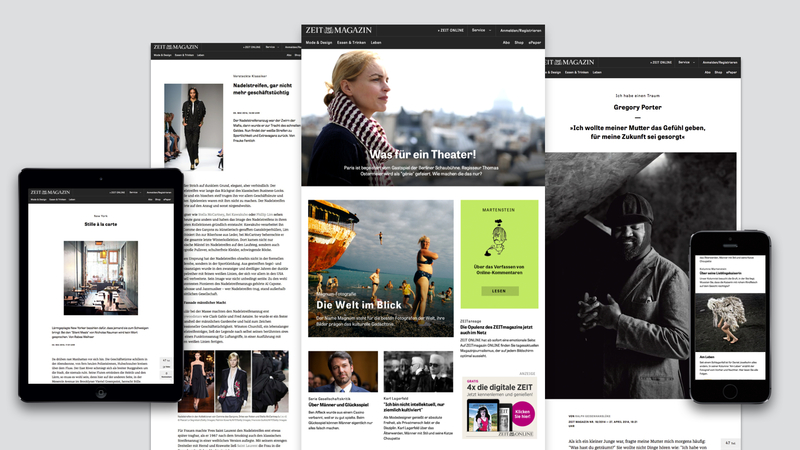 We enable editors to choose from a range of layouts to establish daily online magazine journalism in Germany. Together with ZEIT ONLINE’s editorial and development teams we set up an agile framework to allow for a fast and interdisciplinary development process. The product development will continue within the next few weeks. Stay tuned for the full case study. If you happen to be in Berlin next week: I will speak about our collaboration more in-depth at TYPO Berlin, Europe’s biggest design conference. Team: Erik Spiekermann, Christian Hanke, Moritz Guth, Harry Keller, Christoph Rauscher, Julian Panzer, Peter Rudolph, Sara Hesse and Michael Börner.